Why Does Humidity & Wind Speed Affect Evaporation? 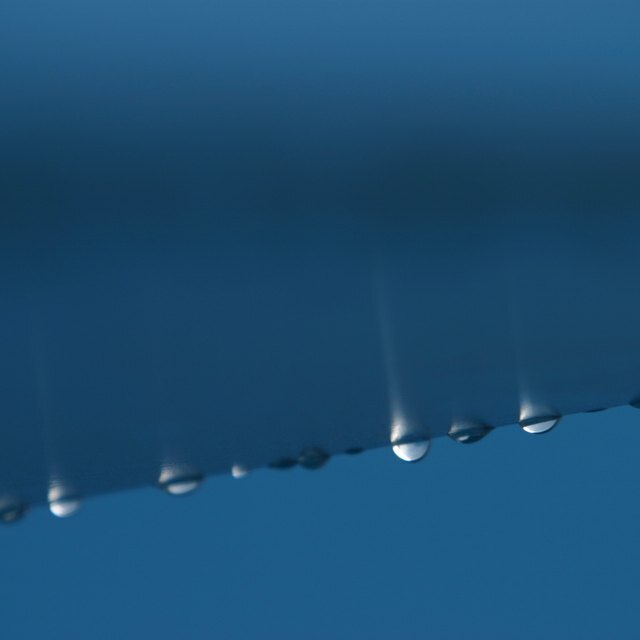 What Happens After Water Vapor Condenses? Why Does Condensation Form on a Drinking Glass? How Does Acid Rain Enter the Water Cycle? What Are the Causes of Evaporation & Condensation? A puddle of water from a morning rain shower is completely gone by noon. Water droplets form on the outside of a glass of iced tea on a warm day. These natural occurrences are the results of evaporation and condensation, the central components of the water cycle. Although evaporation and condensation are opposite processes, both are caused by water molecules interacting with the warm or cool air around them. Evaporation occurs when liquid water turns into a water vapor, with about 90 percent of the water going through such a transformation originating from rivers, lakes and oceans. It's easiest to understand the cause of evaporation by considering a pot of boiling water. Once the water in the pot reaches the boiling point, 100 degrees Celcius (212 degrees Fahrenheit), water vapor in the form of steam can be seen rising from the pot. Heat is the cause of evaporation, and is required to separate water molecules from one another. While the process doesn't often occur as rapidly or as obviously in nature as it does with the boiling pot, heat is still at work wherever there is a body of water, separating water molecules so they can be carried upward, transforming water from a liquid to a gas. Wind speed, temperature and humidity are all factors affecting evaporation in nature, although they are not the actual cause of evaporation. Both wind and higher temperatures can cause liquid water to evaporate faster. Wind increases the overall volume of air in contact with a surface, providing more capacity for retaining moisture. Higher temperatures also increase the amount of moisture that can evaporate into the air. High humidity has the reverse effect on evaporation. Since the air is already holding a relatively large quantity of water it is limited in the amount of additional moisture that it can carry away through evaporation. In other words, higher levels of humidity slow the rate of transforming liquid to gas. Evaporation isn't the only way water turns into vapor. Transpiration is a similar process whereby plant leaves "breathe" water drawn up from the roots as water vapor. Frozen water can evaporate as well, although this process is called sublimation. Rapid increases in temperature can cause snow to turn instantly into vapor instead of melting, a process that further illustrates the significant role that heat plays in evaporation. Like evaporation, condensation occurs as part of the water cycle. Water molecules that have traveled upward through evaporation eventually meet the cooler air at higher levels of the atmosphere. Water vapor in the warm, moist air condenses, forming larger droplets of water that will eventually be visible as clouds. The cause is the change in temperature. The cooler air can't keep water molecules separated, so they combine again to form droplets. Condensation is occurring even if clouds are not visible. As more water vapor condenses, clouds typically begin to form. Precipitation follows, and the water cycle begins all over again. Lori Weaver is an experienced online writer and editor. She frequently contributes to a number of sites and covers a range of subject areas, including automotive trends, finance, marketing, sustainable living, renewable energy, healthcare, agriculture, real estate and other topics. She holds a degree in journalism from the University of Wisconsin, Madison. How Does Rain Come Down From Clouds? What Is the Average Rainfall for a Tundra Climate? Weaver, Lori. "What Are the Causes of Evaporation & Condensation?" Sciencing, https://sciencing.com/causes-evaporation-condensation-15062.html. 26 April 2018.